I have Christmas cards to write and post. I have Christmas presents to wrap. There's even a few presents still to buy. But I can't stop scrapping! 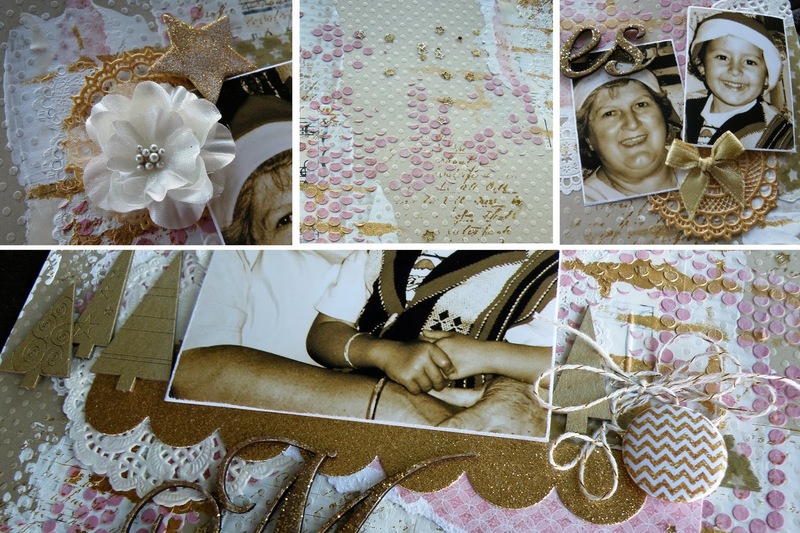 I created this layout for the Kraft It Up December challenge. Of the two choices I went with the pink and gold colour palette. I loved the aqua and silver colour palette as well but having just received the latest D-lish Scraps Just Add Paper Kit (All that Glitters) it was pretty clear to me that I'd be scrapping with gold for a little while! I've been a huge fan of the D-lish Scraps Just Add Paper Kits for a really long time but the December release, All that Glitters, is by far my favourite (so far LOL). The kit is quite simply overflowing with fabulous, unique products. I've barely made a dent in the kit creating this layout, am planning another two layouts (a double and a single), and am sure I will still have products left over to add to my D-lish Scraps stash! I know its Christmas and we really should be writing cards, wrapping presents, shopping, baking, decking the halls LOL but, like me, do try and find the time to take some time out for you. Maybe fit in a little scrapping. If you can find the time and you're short on inspiration why not give the Kraft It Up challenge a go? Your layout doesn't need to be Christmas themed but if, like me, you'd like to delude yourself that you are doing something Christmas related LOL, why not scrap some of those Christmas pics you've got lying around or in old albums?